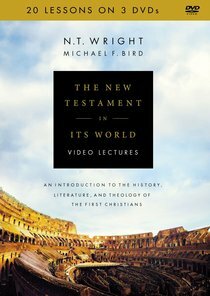 The New Testament in Its World Video Lectures accompany the definitive seminary-level introduction to the New Testament by N. T. Wright and Michael F. Bird. It presents the New Testament books as a literary, narrative, and social phenomena located in the world of second temple Judaism and early Christianity covering the third century BCE to the mid-second century CE. About "The New Testament in Its World: An Introduction to the History, Literature, and Theology of the First Christians (Video Lectures)"